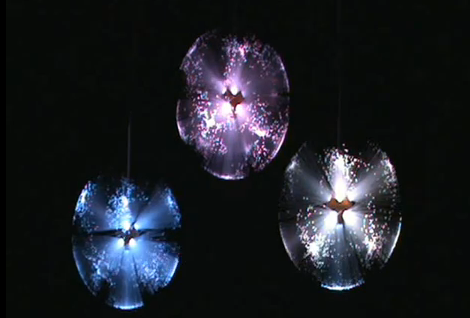 Five bucks will buy you a STRÅLA lamp from Ikea. It’s a battery operated hanging lamp that pipes the light out through multiple branches of fiber optic bundles. But you’ll only get white out of this, which is pretty boring. [Boris] decided to swap out the stock LED for an RGB unit and drive it with an Arduino. The lamp nucleus is just a couple of pieces of plastic which can be popped apart to reveal the shard of PCB hosting one LED. The body of that diode is flat on the top, and [Boris] filed down his replacement to match the form factor. There are only two conductors in the wire that runs between that PCB and the battery pack, so he replaced them with four conductors (R,G,B, and GND). His prototype uses the Arduino’s PWM capabilities to control the colors, but [Boris] recommends transitioning to a simple chip like a PIC 12F675 or one of the smaller ATtiny microcontrollers after you’ve got the bugs worked out. See how this turned out in the clip after the break. Electrical Engineers don’t need push pins. That’s because they know how to control electrons! [Sven] put his knowledge of these subatomic particles to use when building his high voltage bulletin board. 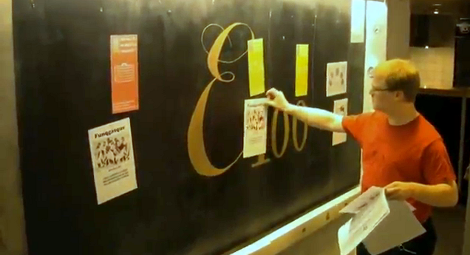 It uses a set of vertically strung wires to keep paper pinned against the board. The wires have high voltage at low current travelling through them. They’re in front of the board, but not touching it, and the board is serving as a ground plane. In this way an electrostatic charge pushes (or should that be pulls?) against the paper to keep each sheet right where he places it. In the video after the break [Sven] gives us a tour of the hardware at work here. It starts with a 12V psu which feeds a buck converter. The regulated feed is patched into a high voltage supply which was designed as a CCFL driver. Finally, a voltage doubler is used to reach the final voltage, measuring about 20 kV per wire. Don’t worry, [Sven] says the bare wire is “almost completely safe” because of the low current being conducted. It seems like every Hackerspace should have some type of kludged together access system on their entry door. [Vasilis] wrote in to share the system called Jarvis that controls access to P-Space, a Hackerspace in Patras, Greece. It’s an RFID-based system that offers a few nice features. They already have a server running the webpage, so basing their entry system off of a computer was an easy option. 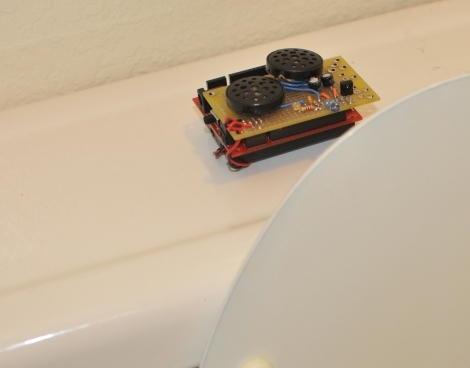 You can get in one of two ways; by presenting your valid RFID tag to a reader at the front door, or by ringing the bell and having a member inside press the Big Button of Doom (BBoD) which is a wireless controller. 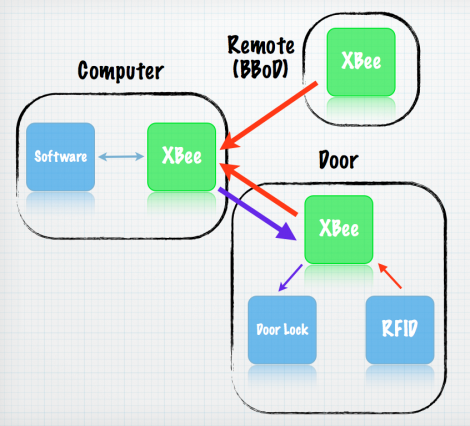 The BBoD has an Xbee module inside which lets it send an unlock command back to the computer. The remote is powered by two AA batteries, and since it’s never on unless the button is pressed the team estimates these batteries should last around one year. There’s even a feedback system. The computer posts the last few events to the webpage. So you can go online and see when the BBoD was used, or who’s tag has recently unlocked the entrance to tell if your friends are there. [Randy] had a cheap megaphone, and like most models in this price range, it didn’t have an audio input jack on board. 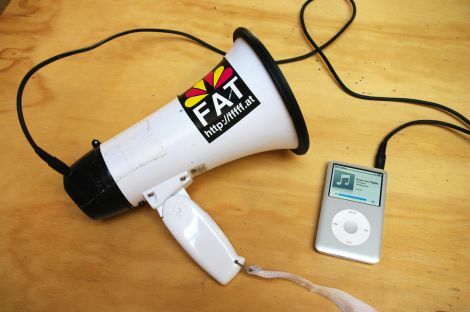 He wanted the ability to pipe both music and audio from an external mic through the megaphone, and in a brief tutorial, he shows how he modified his bullhorn to do just that. Most megaphones carry their electronics near the built-in mic, just outside the battery compartment. Removing the screws from the cap in [Randy’s] model revealed a circuit board and a couple of wires connecting it to the on board mic. His megaphone happened to play some canned music from a secondary circuit board, and he spliced in an audio jack with a built in cutoff switch between that and the main PCB. He also added a resistor in between his jack and the microphone circuitry to attenuate the line level signal properly. Once he reassembled everything, and then tested his input using a portable audio player, slowly ramping up the volume to the desired level. It’s not every day that you require the ability to blast music through a bullhorn, but [Randy’s] modification is a great addition when you do need it. Locks are always temporary hindrances. After deciding to open the RFID-secured lock in his department, [Tixlegeek] built a device to read and spoof RFID tags (French, Google translate here). The system is built around an ATMega32 microcontroller with a 16×2 LCD display. A commercial RFID reader module takes care of all the sniffing/cloning duties, and a small modulation circuit handles pumping those bits over to a lock. Right now, the spoofer can only handle reading and spoofing 125kHz RFID tags with no encryption or authorization. A tag that’s more complex than the duct tape RFID tag doesn’t work. [Tixlegeek]’s little project does open up a few interesting avenues of exploring stuff that’s most certainly illegal. A smaller version of the project could be emplaced near a door or other RFID reader and left to crack a lock with a 32+62 bit password at 125 kilohertz. It wouldn’t be the fastest safecracker in the business, but it would work automatically as long as there is power. If you’ve got any other ideas on what [Tixlegeek]’s RFID spoofer could do, leave a note in the comments.